More than 25,000 Muscovites visited the opening festivities for the world’s largest ice skating rink at VDNKh, in the north of the Russian capital. 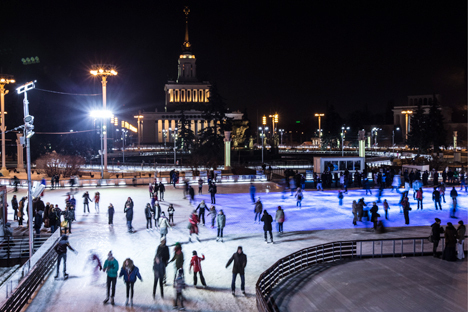 The largest artificial ice rink in Europe has opened its doors to skaters in Moscow on the main avenue of the All-Russia Exhibition Center (VDNKh), between the Friendship of Peoples Fountain and the Stone Flower Fountain. More than 25,000 Muscovites visited the opening festivities at VDNKh on Nov 28. The rink’s first day attracted a huge cluster of ice skaters. The VDNKh administration had to limit entry to prevent a stampede on the ice. The rink boasts 20,510 square meters of ice, which is 1,310 square meters more than the most recent record for the world’s largest rink, reached at the FlevOnice ice skating rink in the Netherlands. The rink at VDNKh offers separate zones for different types of skating in order to ensure comfort and safety. Backlights illuminate 5,000 square meters of ice. In addition, visitors are treated to a pedestrian bridge in the form of multicolored iridescent waves. For convenience, the rink offers six equipment rental pavilions, three changing rooms, two medical areas, five cafes, and restaurants.